Posted on January 16, 2019, by Tim Stoneham in Tea News . Turmeric has taken the health world by storm over the last few years! Turmeric or Curcuma longa is a member of the ginger family and has been used in a variety of different way in South Asian cultures for centuries. We know it mostly for its use as a spice in cooking; however, it has long been used in traditional medicine, as a dye and as a part of traditional ceremonies throughout Asia. In Indian Ayurvedic medicine practices it was used to aid in the treatment of a whole host of different internal problems including indigestion, throat infections, common colds, or liver ailments, as well as being used topically to cleanse wounds or treat skin sores. So what makes turmeric good for you? It’s believed to be due to its main ingredient, curcumin, which is the compound that gives turmeric its yellow appearance. The main potential health benefit of curcumin is its anti-inflammatory effect. Turmeric’s anti-inflammatory properties have been compared to those of non-steroidal anti-inflammatory drugs (NSAIDS). Clinical trials have shown that it is more effective than a placebo for relieving pain and swelling in people with osteo and rheumatoid arthritis. However, more detailed research is still needed to determine and document the efficacy of curcumin and combination products in patients taking NSAIDS to treat osteoarthritis. Other research is being undertaken to see whether turmeric has any other effect on conditions such as pre-menstrual tension and Alzheimer’s disease. The studies are still in their early days and more clinical trials are required before really making any conclusions, but it’s fascinating to keep up with! It’s important to note that levels of curcumin will vary with each piece of turmeric used. 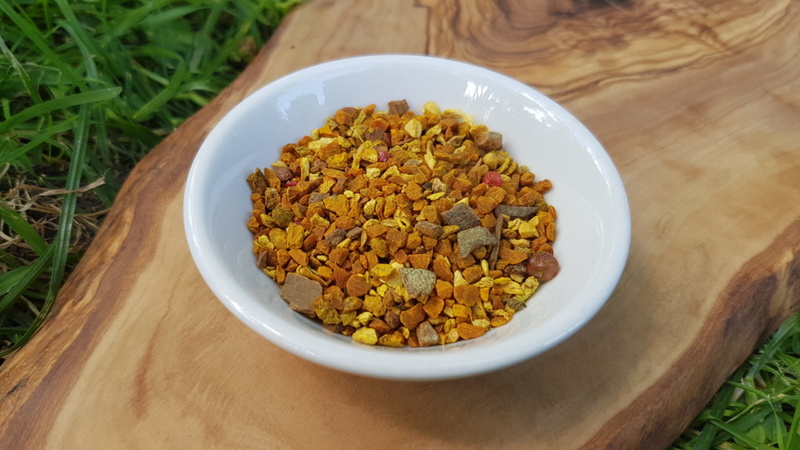 This will be based on a whole variety factors, such as growing conditions, the species, when/where it was harveted, etc… However, one thing we can safely say is that it’s a tasty addition to your food, and your tea! 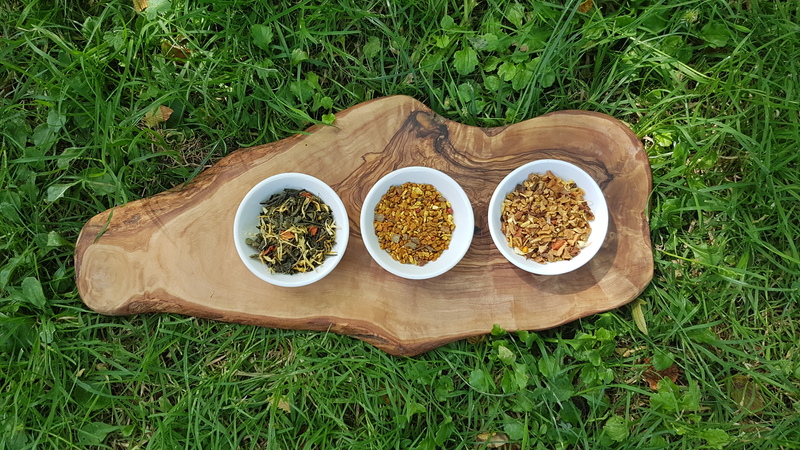 We now have a collection of teas that contain turmeric! 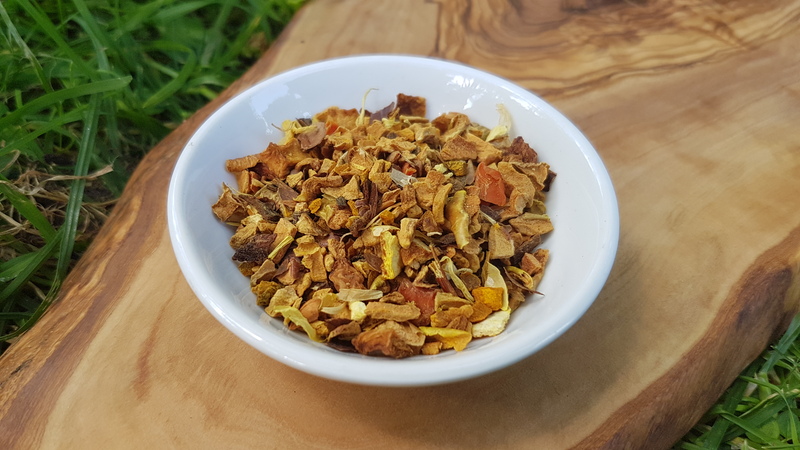 This caffeine free blend can be drunk at any time of the day, but works particularly well after a meal as an aid to digestion and a pallet cleanser. In our collection this tea has the highest quantity of turmeric. The infusion gives a rich, warming spiced flavour that can be perfect on a chilly Winters eve! 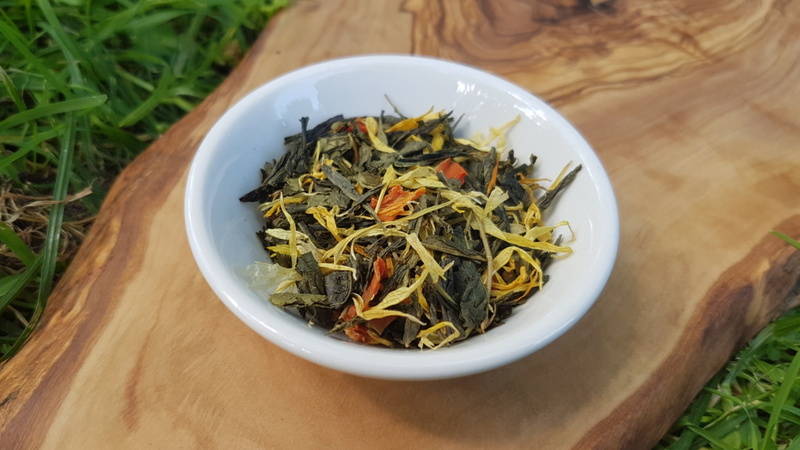 We introduced this blend last summer after a few requests for a green tea blend with turmeric. It gives a well balanced flavour between the tea, mandarin and turmeric. Green tea is known for being high in antioxidants and lower in caffeine than its black tea counterpart. This blend has become a firm favourite with all of us in store and we’ve found it’s a great drink for after lunch! This may seem like a more unusual flavour combination, but it has fast become one of the most popular fruit tea blends in our shop! A naturally caffeine free blend of fruits and spices (including turmeric! ), it’s a great drink for any time of the day! Let us know which is your favourite Turmeric blend on our facebook or instagram!